Thom Conboy at Merle Wood & Associates calls with the glad tidings that, working with Jimmy Broddeson at bluewater, he's sold Mondo Marine's 39.4m motor yacht Villa Reis. 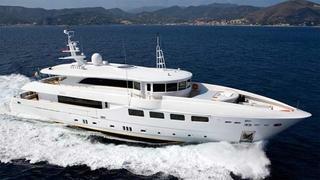 A semi-displacement yacht, Villa Reis was built to RINA class by the Italian yard in 2008. A distinctive interior by Luca Dini offers accommodation for 10 guests in five staterooms plus seven crew in four cabins and twin 1500hp MTU engines give this superyacht a cruising speed of 15 knots and a range of 2,600 nautical miles at 11 knots. Villa Reis was asking €7.5 million.